Have you ever had pain or sensitivity in a specific tooth? It’s probably a cavity. These small holes in your tooth enamel can cause pain, sensitivity, and more serious dental issues like root canals if left untreated. That’s where fillings come into play. Your dentist can expertly fill cavities to restore your smile to its full health as well as protect it from future damage. The original dental filling was made of a metal alloy called amalgam. This alloy is made up of mostly silver, but it also contains up to 50% mercury. Not only is mercury a health concern, but these fillings require some altering of your natural tooth structure. This means that part of your tooth is removed to better accommodate and position your amalgam filling. The only advantage that come with these fillings is that some dentists believe they are stronger than other materials. If amalgam fillings don’t sound appealing, have no fear, modern dentistry is here! Your dentist in Orange Park uses tooth-colored fillings made out of a special composite. It requires little to no alteration of your natural tooth, and it is made with silica and plastic material that blends in with your original smile color. Another differentiating factor is that tooth-colored fillings actually bond to your teeth, whereas amalgam must be fitted into a socket-like position to stay in place. 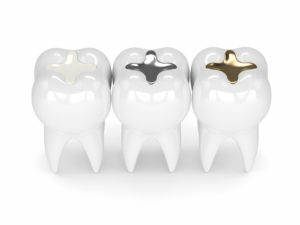 Some dentists may use various metals or even gold as fillings. The advantage to using these materials is that they typically last for longer periods of time. Another common material for fillings is ceramic or porcelain. Their main benefit is that they are stain-resistant, so they stay whiter for a longer amount of time. However, this material can be more abrasive, which some patients find distracting because it feels unnatural. Luckily for you, there are options to choose from. The most important thing is that you get your cavities restored, but if you have the choice, why not get fillings that blend in with your smile? Contact your dentist to get started on a healthy and natural-looking grin. A graduate of the University of Florida College of Dentistry, Dr. Matthew Nawrocki is a highly-trained dentist with a passion for quality care. He stays up-to-date on the latest in dentistry through membership in various organizations like the Florida Dental Association. He currently runs his own practice, and he can be contacted through his website or by phone at (904) 272-1588 for any questions.